THE GOG BLOG by Rory Spears, Editor and Director of Content. Follow Rory on facebook, linkedin and twitter @GogBlogGuy. 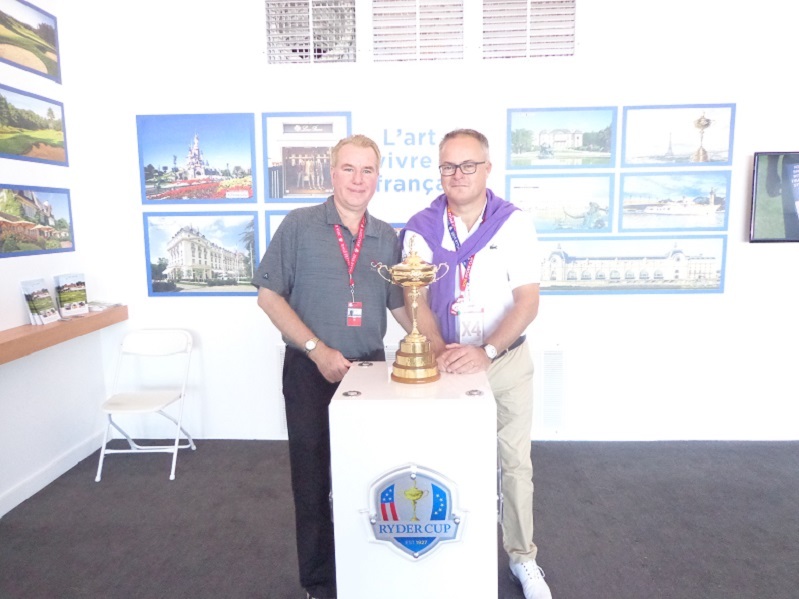 In the Paris 2018 Ryder Cup tent with Golf National GM Paul Armitage. The Ryder Cup in America is over at Hazeltine, and now it’s time to look ahead to 2018 when the Ryder Cup visits France. The Ryder Cup now in the hands of the American’s, will be contested by the European’s in a fierce manner in an attempt to win back the cup. All of this in the shadows of the Eiffel Tower in Paris. In fact those that are buying corporate hospitality, will have options of buying a table in the dinner area of the tower in downtown Paris. Your scorecard for golf at the National Golf Club of France. The National Golf Club of France was created with the Ryder Cup in mind. The holes have been built in a stadium like style to handle large crowds expected at a Ryder Cup. Paul Armitage the GM of the resort that will host the 2018 Ryder Cup, feels that his advance team has learned a lot from it’s time at the last three Ryder Cups. He hopes for one of the best experiences in 2018 that Ryder Cup fans have ever experienced. Golf is growing in France and there are now over 700 courses in the country. With a few more expected to be built by 2018. Before during and after the Ryder Cup Armitage and French Golf Foundation Chairman Pascal Grizot are looking forward to more american’s bringing their clubs when they visit France and the Paris area. Click here to hear our interviews with Paul Armitage and Pascal Grizot on golf in France and the Ryder Cup coming to Paris in 2018. The Gog Blog returns with more on the Ryder Cup front later this week, stay clicked in.